This Irish Santa decoration is a firefighter and he is ready to wish you a Merry Christmas! 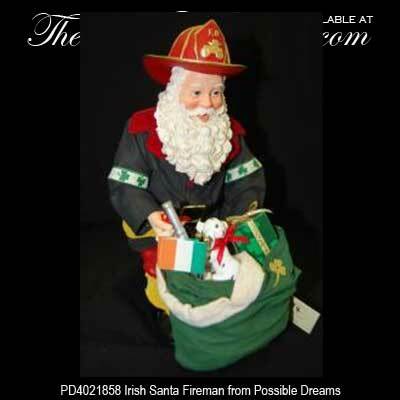 Irish Santa fireman figurine from Possible Dreams features shamrock reflector strips on his coat along with a shamrock decorated package and Irish flag among the gifts in his sack. The Irish Santa is made of porcelain and clothique© and measure 6.5" wide x 10.5” tall. The Irish Santa Clause firefighter is gift boxed with a shamrock history card that is complements of The Irish Gift House.